With its stunning Scandinavian design, the Innolux Tubo is both a beautiful addition to your interior décor and a medically approved solution to Seasonal Affective Disorder and other conditions. 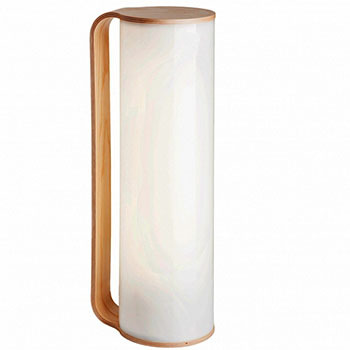 The Tubo makes an excellent table lamp and is easily moved thanks to its compact, all-in-one construction. It has an output of 2,500-10,000 lux, the perfect range for bright light therapy. Its dimmer switch means that when you are not using it for light therapy it will make a beautiful standard lamp, adding modern style to your home. Its cool, bright light is accented with an elegant ash wood casing that is typical of the Scandinavian interior design that is so popular and fashionable these days. You don’t have to sacrifice style to achieve the best in light therapy treatment – with the Innolux Tubo you’ll have a chic, happy and healthy home. Being depressed, tired and unable to cope in winter is a sign that you may be suffering from S.A.D. Feeling low all the time makes life really difficult and will have a negative effect on your work and personal relationships as you struggle to enjoy the things that normally make life worth living. But don’t despair! You can treat your S.A.D. at home with the Innolux Bright Design Tubo light. Designed to medical specifications, it uses light therapy to counteract the conditions that cause S.A.D. and make you feel back to normal. If you do shift work, you may find that you struggle to stay awake in the evening and then wake up very early in the morning at a time that’s not convenient, or perhaps you find that your sleep schedule varies a lot or causes you to wake often during the night? Sleeping badly can be so stressful and prevent you from living a happy life. The Innolux Tubo will gently adjust your circadian rhythm and help you to regain a normal sleep cycle. The amount of light we can see is measured in a unit called ‘lux’. This is similar to the familiar unit of ‘watts’ that we use to measure how strong a lightbulb is, but it refers to what we can see with our eyes rather than the amount of energy being used by the bulb. During the summer months, the amount of light we are exposed to from the sun is anywhere from 50,000 – 100,000 lux. When the seasons change and we spend more time indoors, the light we are exposed to from indoor lightbulbs can be as low as 100-200 lux. This is what leads to Seasonal Affective Disorder and other complaints. Bright light therapy counteracts this by exposing you to specially designed lights of 2500 lux and above (the Tubo emits 2500-10,000 depending on how close you are to it). You can get a head start on your S.A.D. by beginning bright light therapy as soon as the nights start drawing in, but it will be effective at any time of year. 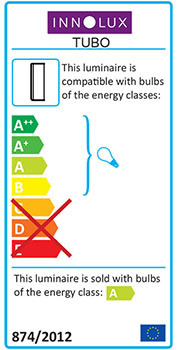 Innolux recommends using your light 3-5 times a week, switching to daily sessions if your symptoms are particularly bad. 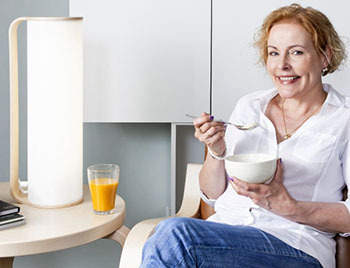 One session of SAD light therapy will last from 30 minutes to 2 hours; it’s fine to do other things during your treatment so feel free to read a book and relax while your SAD lamp does its work. As long as your face is within 40cm of your Tubo lamp you will feel its effects. You can undertake a session at any time between 6am and 6pm, but the most effective time for treatment is between 6 and 8am – this has the added benefit of waking you up so you can start the day refreshed and ready to go! Included in the lamp’s instruction booklet is a therapy diary, which will help you to track your treatment and find the best times and frequency for you. Bright light therapy is not just effective for S.A.D. and sleep disorders - if you struggle to stay awake in the evenings, a session in the afternoon will help you to stay up for longer and enjoy the nightlife. Going on a trip abroad? Lucky you! When you’ve returned, your Tubo light therapy lamp can help you to recover from jet lag; an evening session will delay your sleep cycle while a morning one will help you fall asleep sooner, helping you to reset your circadian rhythm and get back into your normal routine.